Anne is a retired teacher from North Carolina. Joe is a retiring arborist and retired college professor (biology). Together, they work with the elemental forces to create a larger, and more complex organism, 7 Acre Wood Farm. Tai Chi in the garden. Note: It’s not a skirt! It’s a kilt. It’s what one wears in the highlands. 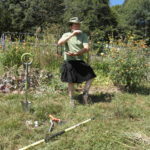 We find that the permaculture ethics of Earth Care, People Care, and Fair Share not only resonate well with us but also make for some convenient titles of webpages to describe our intent at 7 Acre Wood Farm. If the above was too much for you to process, just think of us as two old hippies. 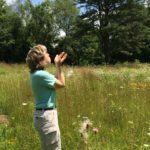 For more information on Anne’s involvement in Reiki and Herbal Medicine click here, Anne’s Biography.